It a great time to live in Pittsburgh . The Super Steelers are on their way to winning their sixth Vince Lombardi trophy . To celebrate Super Bowl week we are having the biggest sale ever !! Take advantage - our entire stock is 40% to 70% off . This is a very big game, especially for Mike Tomlin! What better way to prove you were the right choice for the job then with a win in the Super Bowl against the two coaches who were suppose to have the job !?! Our hats are off to the whole Steeler Team . Good luck and beat the pants off those red birds ! GO STEELERS . AFC CHAMPIONSHIP WEEK SALE ! Warbucks, Boaz,Brick Diggler and Big Casey Hampton . It's January and cold as ice in the Steel City. One thing that gets us threw these bitter winters is our Pittsburgh Steelers. 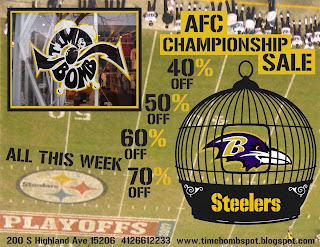 AFC Championship week is here in the burgh and the Steelers are getting ready for WWIII against the Baltimore Ravens. 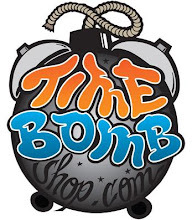 Come celebrate championship week with us here at Timebomb. We're having a HUGE sale 40 % - 70% off all winter collections. 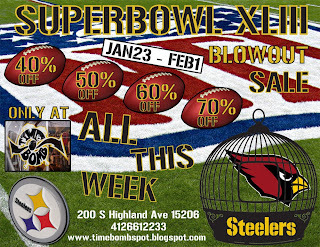 Stop thru and you might catch one of your favorite Steelers shopping for there fits . Stop thru and GO STEELERS.